Much like the remote-controlled cockroaches that have already made June 2013 the month I wanted to begin a career in mass extermination, this story also involves electronically controlled insects, though these are left with a tad more independence. 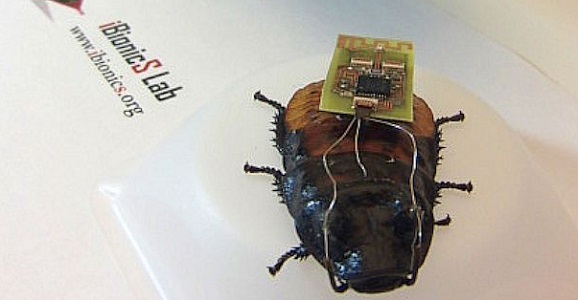 Researchers from North Carolina designed a DIY method of turning roaches into robots just over a year ago, but now they’ve implemented the Kinect system in order to give the roach some passive guidance. Wires are inserted into the roaches’ sensory organs, which propel them forward, and “small charges injected into the roach’s neural tissue trick the roach into thinking its antennae are hitting a barrier,” and the roach will instinctively turn. A digital pathway was created by a computer, with invisible boundaries keeping the roach on its path, and by pointing the Kinect at the insect, its movements can be monitored and recorded. (They should use this WiFi tracker one day.) Take a look at the oddly silent test video below. You wouldn’t expect NASA to be a crowd-pleaser at this year’s Game Developers Conference (GDC), but sometimes when the government cuts back on a chunk of your funding, you have to appeal to the demographic that still loves you. For a presentation titled “We Are the Space Invaders,” NASA public speaker Dr. Jeff Norris — who also happens to manage to Planning and Execution Systems Section at NASA’s Jet Propulsion Laboratory (JPL) out of Pasadena, California — opened the panel with a video of the first man to orbit Earth, Yuri Gagarin, juxtaposed next to a video of one of the earliest video games, Spacewar!, which was created in 1961, the same year as Gagarin’s famed flight. So what’s the connection? A one-ton, Kinect motion-controlled rover that another presenter, NASA’s Victor Luo, walked over a simulated asteroid surface located at JPL, as well as showing off the motion-controls to maneuver robotic hands and to land a Mars Rover in the Kinect-controlled game Mars Rover Landing. The presentation also showed other ways in which NASA has used the gaming industry in its research and development. Of course, the loftier and slightly out-of-reach goal is what drew the saliva from the corners of everyone’s mouths: showing a picture of Star Trek: The Next Generation‘s Enterprise D before bringing up the holy grail of the holodeck. Norris went on to explain his wishes and goals, which are definitely his alone and have never been discussed at end by sci-fi fans for years.